It was only last week that I wrote about the apparent abandonment of drug driving campaigns yet this morning I find that “Think! Road Safety” has launched a fresh assault on potential drug drivers; this time, using the popular social media app “Snapchat” as its platform. Snapchat has become hugely popular of late given the numerous editing tools available to users once you’ve taken your shot. You can make you (or your subject) vomit rainbows, shoot lightning from your eyes or even become a drag queen. With the latest update however comes a new overlay for your mug shot. You can now place yourself behind bars with a drug driving slogan underneath. You can see our very own Ruth Peters demonstrating the tool, doing her best (yet, not very good) impression of a drug driver who’s just been caught! It is an interesting (and inspired) approach from Think! and whilst it will no doubt bring a smile to many Snapchat users, it is also sending a subliminal reminder about the risks of drug driving and informing users of the new roadside swab tests that are now used. 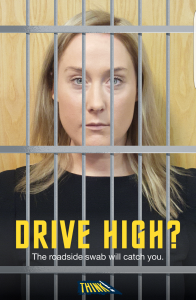 Whether the users have any interest in the campaign or not, getting a laugh out of putting your gran behind bars can only be a good thing when it is exposing potentially millions of people to the drug driving campaign. This is the first Snapchat campaign I have seen of its kind and it will be interesting to see if THINK! and other organisations utilise the tool for future campaigns and tap in to its potentially unlimited reach. Need Help From a Specialist Drug Driving Lawyer? 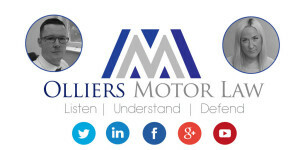 Neil Sargeant is head of Olliers Motor Law having specialised solely in road traffic cases since 2008 . If you are facing a drug driving conviction then please give the team at Olliers Motor Law a call on 0808 168 0017 for free advice.